Reuben Archer delivers good, solid, British hard rock. Reuben Archer proves the point that it's better late than never as he releases his first solo record as he turns 70, making the Rolling Stones seem like a boy band. Archer, having fronted Stampede, Lautrec, Wild Horses, Lionheart and the Paul Raymond Project, is of course a very seasoned singer. He brings his wealth of experience to this project and with the aid of his Stampede band mate Rob Wolverson they've created a great hard rock record. A lot of care has gone into the production of the disc and Archer has done a lot of work on the harmony vocals that give the choruses added power and melody, as well as variety. The tracks themselves, although Archer tries different things on each track, hold together well as a cohesive album. There are strong rock tunes such as the radio friendly 'Bullet Proof', the hard rocking 'Desperation Train'. Even a cover of Johnny Kidd and The Pirates' 'Shakin' All Over' isn't a tired rerun of the song but instead it's given a full metal make-over that works well. Although in the liner notes, penned by Malcolm Dome, his winning way with a lyric is pointed out, there are a couple of occasions on this record when his lyrics get a little too simplistic, such as on 'Play My Rock 'N' Roll', and some choruses repeat their hook-line more than is necessary. However, age hasn't diminished his singing power and the record is further enhanced by some of the musician friends he's made over the years who lent a helping hand here. For a man who's been making music since the dawn of time it's not surprising that this guest list is long. As well as members from his previous bands, there's the mighty Dave Meniketti from Y&T, Luke Morley from Thunder / The Union as well as Neil Murray and Harry James from Snakecharmer, and Paul Quinn from Saxon amongst others. Who says sin doesn't do you any good in the long term? 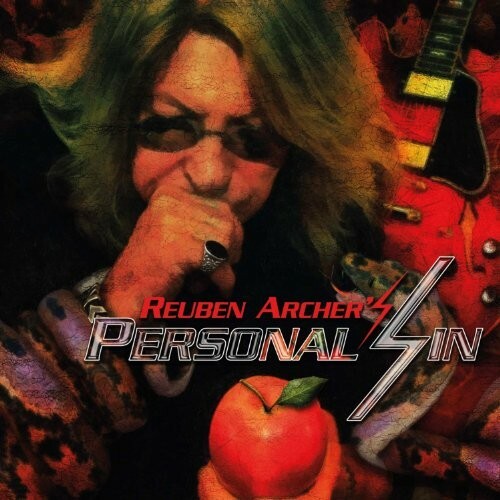 Reuben Archer's Personal Sin has served him well as there can't be many septuagenarians who could pull off an album of hard rock with as much vitality as when they were in their prime. Reuben Archer delivers good, solid, British hard rock.